2 years & up. These fine motor and manipulative sets are great for all young architects just starting to build. The jumbo sizes are ideal for small hands and are easy to clean and sanitize. 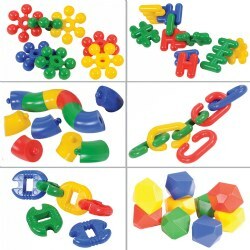 Set includes: Giant Stars, Criss Cross, Roll 'N Twist, Chain Links, Snappers, and Gem Blocks. Each set comes in a container for storage measuring 11 1/2"H x 19 1/2"W x 12 1/2"D.
3 - 6 years. Using the manipulatives from this kit, children 6 and under will learn about mathematic principles, including geometry, patterns, and one-to-one correspondence. 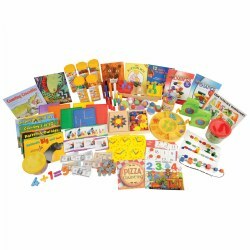 This kit and its components enhance the math activities in "Learn Every Day™ : The Preschool Curriculum" through the use of counters, shapes, and children's literature about math. 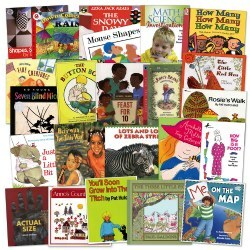 Activities in this kit encourage interaction and help children explore math concepts. 2 years & up. Perfect for group or individual play! Features all types of shapes mixed with traditional blocks and they're easy to stack, build, connect, twist, and snap. Play value is enhanced because children can create a limitless number of designs. Sets are colorful, durable and easy to clean and sanitize. 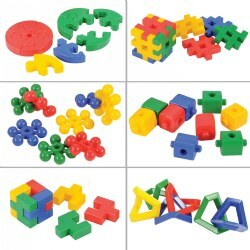 Set includes Puzzle Pie Blocks, Click Blocks, Mini Stars, 2-by-2 Blocks, Mini Forks, and Angles. Each set comes in a container for storage measuring 7 1/2"H x 14"W x 8 1/2"D.